Brenthaven Elliot Deluxe Brief Notebook Carrying Case - 15.4 InchThe Elliot Deluxe Brief is a low-profile, contemporary business solution for the daily commuter and the road warrior alike. This trolley compatible laptop brief features best-in-class device protection, with dedicated compartments for an iPad and a laptop up to 15.4 Inches. The Brenthaven HDF™ protection system wraps devices in a layer of high density foam and elevates them away from the bottom of the case. Other features include TSA X-ray Friendly organization, a quick access magnetic pocket, a front slip pocket for a cell phone and a zippered organizer compartment with space for small accessories and necessities. Pair this deluxe brief with the Collins Laptop Sleeve for added device protection. The Elliot Deluxe Brief is a low-profile, contemporary business solution for the daily commuter and the road warrior alike. This trolley compatible laptop brief features best-in-class device protection, with dedicated compartments for an iPad and a laptop up to 15.4 Inches. The Brenthaven HDF™ protection system wraps devices in a layer of high density foam and elevates them away from the bottom of the case. Other features include TSA X-ray Friendly organization, a quick access magnetic pocket, a front slip pocket for a cell phone and a zippered organizer compartment with space for small accessories and necessities. 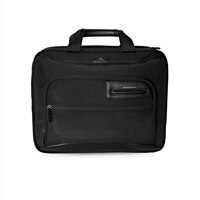 Pair this deluxe brief with the Collins Laptop Sleeve for added device protection.